So, there’s a Christmas parade downtown tonight! Did this fact escape you too? The 59th Annual Nashville Christmas Parade will get started tonight at 7pm by crossing the totally-structurally-sound-despite-being-hit-by-a-barge Woodland Street Bridge, then make its way down 2nd Avenue and Broadway before ending around Broadway & 7th (map). This year’s parade is supposed to be the largest ever, with grand marshal Vince Gill leading the way for over 80 parade participants. There will be floats, marching bands, giant inflatable things, gift-wrapped U-hauls, dance troupes, people in creepy costumes, the works! There’s also the annual Rudolph’s Red Nose Run 5k beforehand, if you’re into that physical-activity-on-a-Friday-night sort of thing. You won’t find us running, but you will find us bundled up, cheering, enjoying some uh, specialty hot chocolate from home and soaking in some holiday cheer. 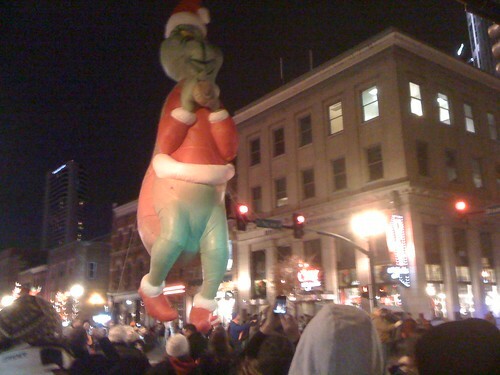 Photo by Stephen Yeargin, who is evidently the only person who takes pictures of the Nashville Christmas parade and puts them on Flickr.